According to a new report North America Industrial Control Systems Security Market (2017-2023), published by KBV Research, the North America Industrial Control Systems Security Market is expected to register a CAGR of 4.5% during the forecast period (2017-2023). The Endpoint Security market dominated the North America Industrial Control Systems Security Market by Security Type in 2016, and would continue to be a dominant market till 2023;, growing at a CAGR of 3.3 % during the forecast period. The Database Security market is expected to witness CAGR of 5.5% during (2017 - 2023). Additionally, The Network Security market is expected to witness CAGR of 6.8% during (2017 - 2023). The Power market dominated the Mexico Industrial Control Systems Security Market by Vertical in 2016, and would continue to be a dominant market till 2023; growing at a CAGR of 4.5 % during the forecast period. The Transportation Systems market would attain a market value of $37.3 million by 2023. Additionally, The Energy & Utilities market is expected to witness highest CAGR of 6.4% during (2017 - 2023). The Firewall market dominated the North America Industrial Control Systems Security Market by Solution Type in 2016, and would continue to be a dominant market till 2023; growing at a CAGR of 1.4 % during the forecast period. The SCADA Encryption market is expected to witness a CAGR of 7% during (2017 - 2023). 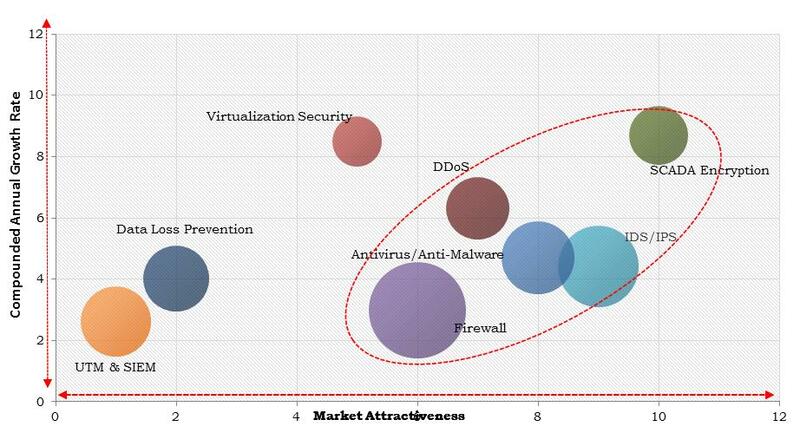 Additionally, The Distributed Denial of Service market is expected to witness highest CAGR of 4.7% during (2017 - 2023). The report has exhaustive quantitative insights providing a clear picture of the market potential in various segments across the countries in the region. The key influencing factors of the North America Industrial Control Systems Security Market have been discussed in the report along with the elaborated company profiles of ABB Group, Belden Inc., Check Point Software Technologies, Cisco Systems, Inc., Fortinet Inc., General Electric (GE), Honeywell International, Inc., McAfee LLC, Siemens AG, and FireEye, Inc.